Tickets can be purchased in advance or on site. Come and marvel at Wilderness Farm, the 20th-century farmhouse selected for the 2018 Historic Ellicott City Decorators Show House. Since 1987, local decorators have been invited to design individual rooms in grand estates across Howard County, in order to preserve the home’s beauty and legacy for years to come. This year, 13 designers will decorate 20 rooms and spaces in Wilderness Farm, drawing inspiration from the history of the home and their own imaginations. Visitors will see a fantastic range of design techniques, ideas and themes. In addition, virtually all of the designer’s accent pieces, furniture, rugs and individual elements are available for purchase throughout the show’s run. 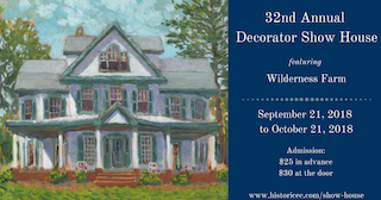 The annual event aims to preserve historic homes in the area for future generations, while also raising funds to support missions dedicated to the preservation and restoration of historic Howard County. This year’s Show House will raise funds to support Ellicott City flood relief efforts. The Show House will be open every Wednesday through Sunday, from September 21 – October 21: Wednesday - Saturday: 10 am - 4 pm Sunday: Noon – 5 pm CLOSED MONDAYS AND TUESDAYS Tickets are $25 in advance on HEC’s website or $30 at the door. Advance tickets can also be purchased at participating partner retailers, listed on HEC’s website. For more information and to purchase advance tickets, visit: www.historicec.org.